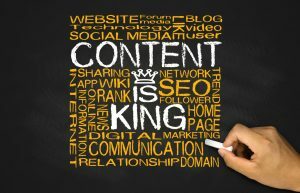 In recent years, the term “content marketing“ has become a popular keyword in the marketing arena. What is “content marketing”? It is a marketing approach that produces and releases content which contains marketing and promotional values thus attracting target or potential customers to read, listen and even interact. This can build the relationship between customers and businesses which can eventually be converted into purchasing action. How does Social Listening relate to Content Marketing? Content marketing is a marketing approach that produces and releases content which contains marketing and promotional values thus attracting target or potential customers to read, listen and even interact. This can build the relationship between customers and businesses which can eventually be converted into purchasing action. The above definition of content marketing contains two specific keywords: “interaction” and “relationship”. In the past, “content” and “purchase” were the only attributes in advertising, which was straightforwardly geared towards encouraging purchasing action. Content marketing is more sophisticated as it includes two further steps – interaction and relationship. Content marketing does not necessarily have the words or messages directly related to purchasing, but it can attract customers or potential customers to engage with your company or organization, for example, to like, comment, or share useful, interesting or resonating content. In his book Your Brand, the Next Media Company, published in 2014, Michael Brito, a former senior vice president of Edelman, the world’s largest PR agency, argued that all businesses should be transformed into media companies. In fact, this trend is already very clear. Many businesses have digital marketing departments that run their own social media content on Facebook, Instagram, YouTube, WeChat and Twitter. What is the relationship between content marketing and social big data? All right! Here, you might ask what’s the relationship between the mega trend of content marketing and social big data, also known as social listening or social monitoring? First of all, social big data presents important information such as topics that target audiences are currently paying attention to on social media, interests, doubts, population distribution, etc. Industry practitioners who oversee marketing are able to understand the preferences and concerns of their target customers through social big data analysis reports and then to provide tailor made content, so as to increase the chances of the target customer groups interacting with their content and to create a positive impression of the brand, product or service. Therefore, understanding insights through social listening has become an important reference tool in the marketing planning process, which has greatly enhanced the effectiveness of marketing content. Now let’s take a closer look at what role social listening can play in content marketing planning. In recent years, the term “content marketing” has become a popular keyword in the marketing arena. In fact, this trend is already very clear. Many businesses have digital marketing departments that run their own social media content on Facebook, Instagram, YouTube, WeChat and Twitter. In addition to looking at how many likes, comments and shares you get from posts on social media platforms, social big data can provide you with more insights. The data can help you identify influential Key Opinion Leaders (KOL) on the internet who always have a large group of loyal fans who can greatly influence people’s brand awareness and perception. In addition, social listening also enables you to monitor the noise generated by your brand – in addition to understanding what internet users are discussing, it also helps you grasp how effective your marketing strategy is, including what kind of content creates the highest engagement, what profile of fans are most attracted by your content, who the most loyal fans to help promote your content are, what types of interactions your posts generate, and if the tone and style of your marketing content suits the tastes of your audience or not, etc. Social listening also helps identify potential keywords that are critical to your brand and the topics your users are actively discussing, so that you can grasp market trends and revisit your brand’s future direction. Social big data analysis can also be used to monitor the marketing content effectiveness of your competitors. Through analysis, the strengths and weaknesses of your competitors on social media will be very clear, which means that you will be able to build on your marketing content according to their shortcomings as well as refer to and learn from the advantages of their marketing content, to further improve yours. The above two steps are ways in which social listening provides you with a lot of useful analytical material. However, the value of these materials depends on how they are used and if they can become practical insights that enhance your content marketing strategy. To put the analytical results of social listening into practice, you have to examine whether you really have a say on some issues and the uniqueness of your content. Without social listening, marketing professionals easily missed out on some important messages related to a product or brand. Therefore, social listening can assist you in planning content strategies with higher marketing value via the insights collected. After the data collection and analysis of social listening insights, the next step is to act. 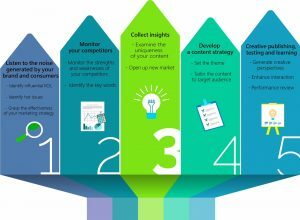 First, starting with the hot topics and keywords collected, good content marketing often highlights ideas through three to five topics or keywords. Social listening analysis reports can provide these topics and keywords. In addition, the social listening analysis report will also provide demographic information on target audiences such as their area of residence, gender, age distribution, job title, hobbies, etc. Therefore, you can tailor the content according to the demographic background of your target audience or push the content through advertising to the population group that matches with these demographic profiles. Social data will also tell you who your loyal supporters are so that you can manage social media wisely to increase interaction with them. For example, offering these loyal fans an exclusive product or service experience could motivate them to spread positive messages about your brand. By grasping the dynamics of competitors on social media, you can avoid spending too much time and resources on areas in which your opponent has had success, exploring other important areas that have not yet been developed, and creating more opportunities that have not been discovered by competitors. Content marketing can be described as a creative publishing, testing and learning cycle of repeated experiments. During this process, social listening provides data reports to tell you whether your experiment has been successful, helping you to keep improving content planning.